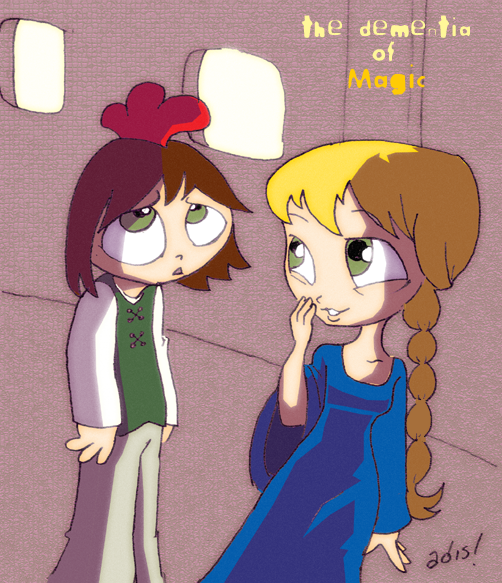 Adis says:Today's Quicksketch Spotlight is on The Dementia of Magic by Nicholas Killewald. Good fantasy comic, a little universe of medieval fantasy, comedy, and big heads. (I find those big heads very charming, actually.) Anyway, here's Nick. You know, you have a great name for a webcartoonist. Did that influence you? How did the idea for DOM came about? Really, the whole thing started with one random doodle of Alex in my college notes about four years ago (note carefully that the comic started only one and a half years ago... I'll get to this later). It's how a lot of my ideas started, really. Random doodles. Anyhoo, the way it eventually wound up, I came up with the two main characters, Alex and Matt, and tried to write them as characters that didn't feel like 'normal' fantasy characters. For example, making them siblings (i.e. no obvious romantic plots), making Alex a mage but making her more tomboyish rather than a "female mage with an attitude" sort of character, making Matt a thief but making him a bit more cynical and 'normal' rather than a "thief who always lurks in the shadows all day" sort, y'know, those kinds of things. Then I did the same thing with the world they live in. Specifically, the magic aspect of it. Like making it so magic isn't exactly 'special', it's more a normal part of life. So that characters like Alex aren't special just because they're mages, they're special because of who they are. Magic's just another skill. Though I will say I just kinda wanted to do this because fantasy worlds have always intrigued me, at least to some degree. I've never read Tolkien in my life, nor really any other work of fantasy, but I'm at least peripherally familiar with some various worlds, and THAT'S what always got my interest, the worlds and how things worked and behaved. You have very distinctive art, those big heads, and their expressions... are you a fan of your own work? Ah, yes, my accidentally cute style... I really never meant for the heads to be THAT huge, you see. I was just trying to make it more cartoony than my original Alex and Matt doodles, and that's just how it worked out. The expressions just kinda came naturally after I got some concept of how to simplify making facial features. That took me a bit. As for being a fan of my own work, I'm generally more a fan of my work when I'm trying to draw something new and it eventually works right. But yeah, I guess I am a bit of my own fan with what I draw normally. Why be a webcartoonist in the first place? Just because, y'know? I just had an idea I wanted to share around but didn't have the l33t skillz, connections, or what have you to try to getanything syndicated (plus my ideas weren't always 'normal', so I doubt anybody'd run them). So I slowly got into webcomics. I liked what I saw from other people, made a few friends in the webcomic world (Petie Shumate, the author of Labgoats, was in fact the first 'random' person to see my comics and like them), and eventually started my little comic. You have a very coherent and cohesive litte universe (and other thing thats start with "cohe"), do you plan ahead or do you write as you go along? Oh, I planned. Man, did I ever plan. Get ready for story time. Anyhoo, because very few people seemed to care, I kinda started to not care as well. (Insert VH1 "Behind The Music" style dramatic music here) I spent more time coming up with ideas for the comic rather than drawing things out. As I kept coming up with ideas, I kept bouncing them off the people who showed an interest in my stuff, and between them and myself, we really got the kinks ironed out in my ideas. Plus, I encouraged them to pepper me with questions that I didn't have answers to. Forced me to come up with answers on the fly to build up the world in ways I never would've planned. This went on for the two and a half years between the first Alex doodle and the start of the comic. Gave me a LOT of material and ideas to go with. So really, being rejected from that community may've indirectly been the best benefit to the DoM. Really, some plots I've got were planned almost exactly how they turned out in-comic. Others, I have an idea of some event that must happen (either because it'd be fun to do or it's vital for a future plot) and I have to improvise enough to get from where I am to that event and work from that. Most of what I do ties back to the discussions I had with my friends. But I DO have an awful lot of stuff planned out in advance, just maybe not the specifics of how it'll happen. Any advice for people wanting to do a fantasy comic set in medieval times? Seriously, you can borrow elements from various fantasy worlds, but make something of your own. Don't restrict yourself to the world someone else made. Make it your world. You were originally hosted on Keenspace. Why move away? Don't you love us anymore? I could get into many gory details and make myself look like more of a jerk than the story for question 5 did, but I'll leave it that there were a few features I wanted that weren't quite available in AutoKeen. So I helped write the script I use now. I can pretty well add anything I want. Heh. I really wouldn't be able to narrow it to one webcomic. So hey, let's just go for a few favorites, right? Pokey the Penguin has always struck my fancy for being so bizzarely quoteable. I'm also a bit keen to some of the Keenspot oldtimers. BoxJam's Doodle and Schlock Mercenary, especially. Schlock seems to have more influence in my work than I first thought. There's also Adam's Road Gang for just pure fun. CYS is another of my favorites, mainly because it's just plain and simply solid writing and art. And there's a few others in there, but hey, who's counting? In your opinion, what would CYS be like if set in medieval times? Thanks a million to Nick. Hopefully everyone enjoyed the interview and my version of Alex and Matt. And go check out The Dementia of Magic for yourself!